You can see how imperfect it looks when it's not lit up, but once you light it...it looks adorable...and it was super inexpensive to make....so for party décor, you can't beat it! First, I bought some foam core, some poster board, a set of clear holiday bulb lights (from Target), and some red gloss spray paint. I already had some gorilla tape on hand, so I didn't need to purchase that. 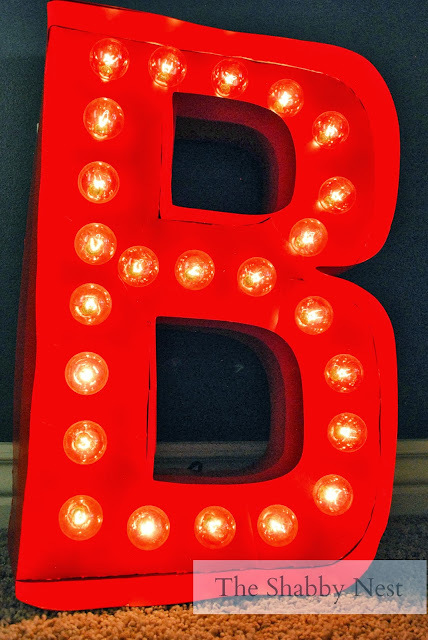 Then I just free-handed a big block letter "B" in pencil on the foam core and cut it out. I used scissors, but I would recommend an x-acto knife if you have one as they cute more precisely. Then I drew a line down the exact middle of the back of the letter B, and cut holes every 2 1/2" using the cardboard holes in the light box as a guide for size. I cut 5" strips from the poster board, and taped them to the foam core on the back...fitting it in the middle of the poster board strip so that there was poster board overhang on both the front and back. I took the letter and spray painted the front and sides glossy red. After it dried, I took the light set apart and poked each one through the foam core, re-attaching the lights on the front side of the letter. I curled the cord up on the back between light so that it would remain hidden. Then I plugged it in and VOILA!! 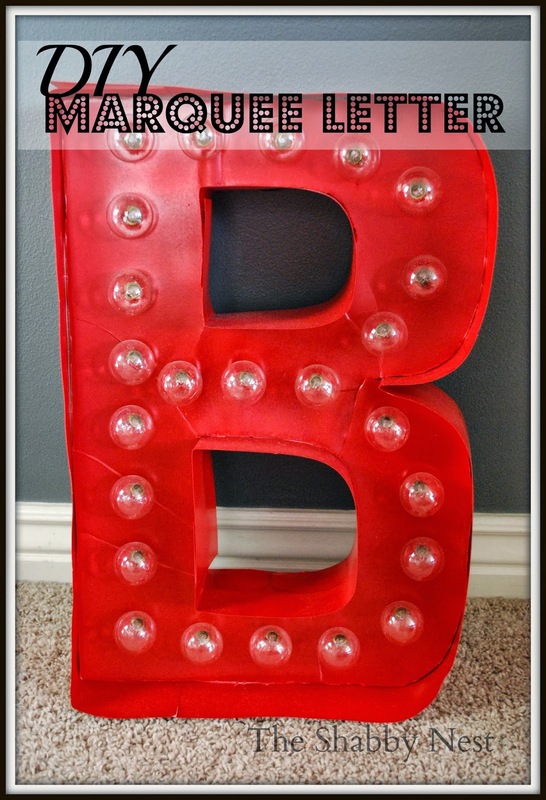 A vintage-look marquee letter...for around $20. Not bad, my friends, not bad. For sneak peeks at projects like these...make sure and follow me on Instagram! Great tutorial! I love utilizing a letter or two in my home for a fun accessory. I bought bulbs from Target, too, to keep as replacements for my nicer Pottery Barn outdoor light strands. Look forward to reading more of your blog. As a new blogger, it's fun to find other creative Moms who've been doing this for awhile. What a fun piece! I've always wanted a light up marquee letter but never ever thought of actually making one myself! I think I might be giving this one a try! I love it! 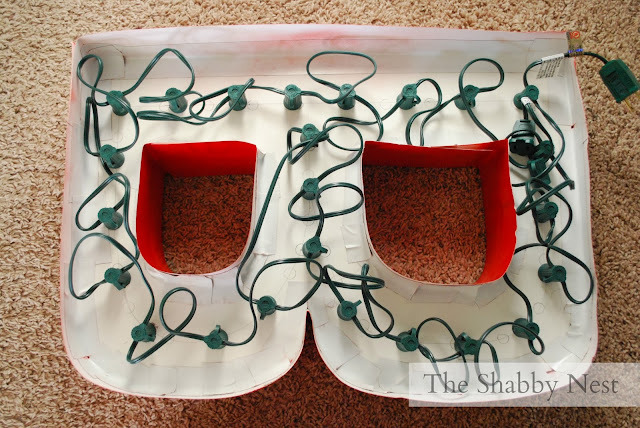 What a great idea... and so inexpensive!